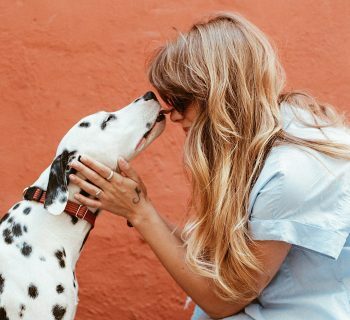 Having a pet is one of the easiest ways to stay in touch with nature and improve your happiness at home. A furry friend will provide you with companionship and affection, but they can often take some work. If you’re a cat person, then you’re probably all too familiar with having to clean your furry friend’s litter box. 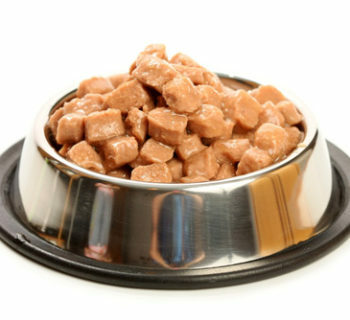 Dog owners love to brag about how they don’t need a litter box in their home, but with an automatic litter box, you’ll nearly forget that you have one too. While automation has done many great things for the world, it can also make simple tasks like cleaning your cat’s litter simpler as well. In today’s article, we’re going to look at five of the best automatic litter boxes on the market, keeping your home clean and your cats healthy. 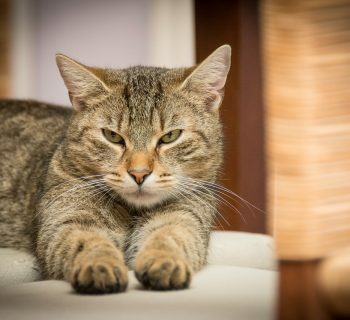 The right litter box can help with more than just convenience, as proper handling of your cat’s litter will improve the health of everyone in the home. The Simply Clean automatic litter box from PetSafe is a relatively affordable option that offers convenience as its main selling point. For example, this PetSafe litter box is easy to set up when you first take it out of the box, requiring only a glance at the instructions to be sure that everything is in the right spot. 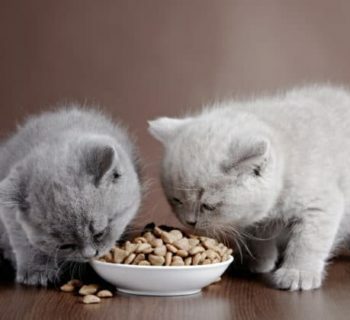 Once you have the litter box set up in your home, you’ll find that it is also easy to use and clean. 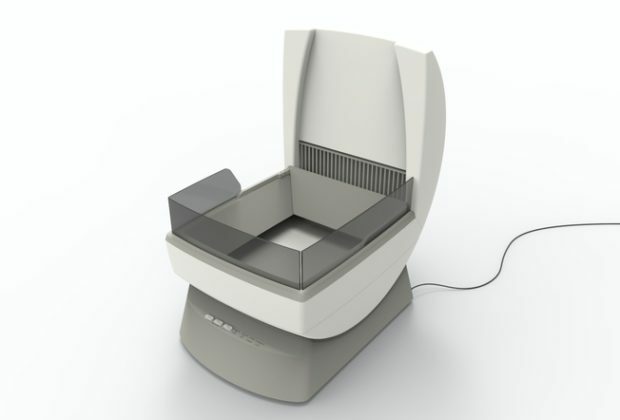 This model uses a conveyor belt and a rotating litter bowl to sift through the litter and transfer any waste to the disposal unit, which takes the form of a small bin. The bin can easily be lined with a bag to make disposal simple. A typical downside to automatic litter boxes is that they consume electricity, adding an upkeep expense that you won’t have to deal with when it comes to normal models. One of the main benefits of this model is that it uses up far less electricity than comparable options, allowing you to save money. Something else that will reduce maintenance costs is the reduced amount of cat litter that you have to use in this box when compared to other automatic options. Overall, this is an impressive litter box that is surprisingly affordable. While the LitterMaid may be a little more expensive than the previous option, it also comes with a few features that make it more convenient. When compared to more affordable automated litter boxes, this model features sealable disposal receptacles, to help keep the scent isolated when the box is cleaned out. Another feature which helps reduce odor is the inclusion of carbon filters which scrub the smell of your cat’s litter out of the air. This litter box is also meant to ensure that the surroundings remain clear of kitty litter, as tracking is a common issue with many automatic litter boxes. The ramp of this litter box is designed to ensure that the cat’s paws are clean by the time it steps on the floor, and the high walls are meant to do the same thing. As you can see, the main concern of this litter box’s designers was ensuring that it is both sanitary and odor-free. The LitterMaid even comes included with four waste receptacles and four carbon filters so that you won’t need to buy accessories for a while to come. 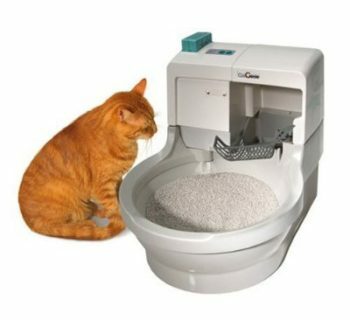 In the end, this automatic litter box is more than worth the money that you pay for it. The CatGenie is one of the most expensive automated litter boxes on the market, but with good reason. 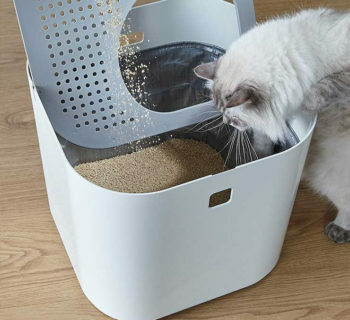 This automatic litter box takes things to a new level by even automating the cleanup process, ensuring that you don’t even have to think about it. It does this by connecting to your home’s plumbing. 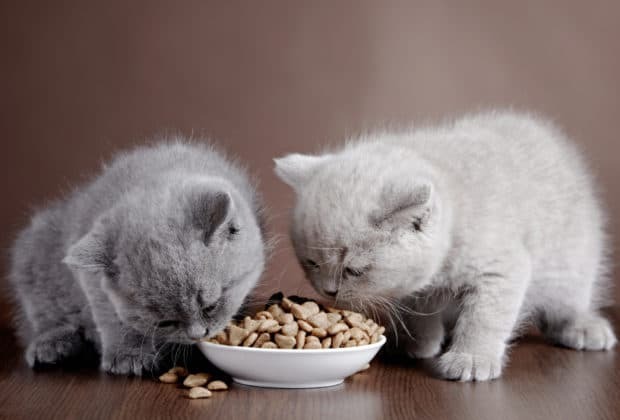 Of course, a litter box which is connected to your house’s water supply will require more effort on your part when it comes to the setup process, but once that’s done, things will go smoothly. As long as you have a convenient spot to place the litter box where it can be hooked up to your plumbing, it will be straightforward. Another benefit to this litter box is that you don’t have to buy new litter for it thanks to the use of the SaniSolution cartridge, which cleans it out with the help of water. 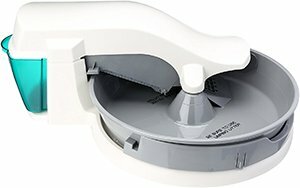 The only thing that you’ll have to maintain when using this litter box is the cartridge itself, which will eventually run out of cleaning solution. 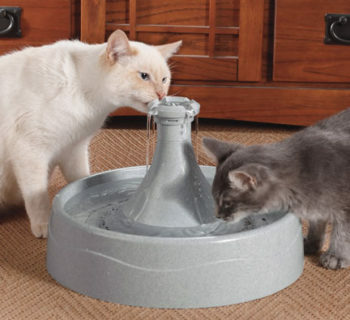 Finally, you’ll also have to connect this model to an electrical outlet, as with most other automatic litter boxes. Overall, the CatGenie is pricey, but it is more than worth the money. them with the convenience and ease of use of a model that operates manually, making it excellent for beginners. 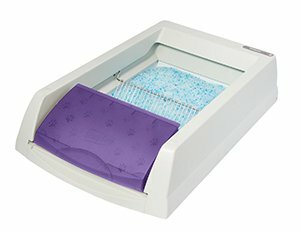 Unlike other automatic litter boxes, the advantage of this model lies in the litter that it uses, which is a non-traditional crystal variety. Crystal litter has the benefit of not tracking onto your floor, eliminating the need for a special ramp. 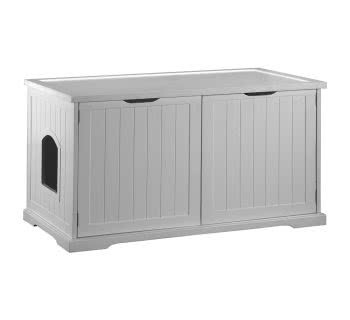 Regardless, this litter box still features high walls to keep your cat from dirtying the surroundings. Convenience is a major advantage of this litter box, and it features fully disposable litter trays that can be thrown out entirely. 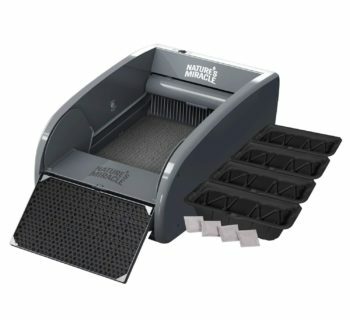 When compared to reusable litter trays, you won’t have to clean them out before the next use, saving you a relatively unpleasant step when it comes to litter box maintenance. The use of crystal litter also makes this model relatively easy to fill up, allowing you to replace the litter in under a minute. 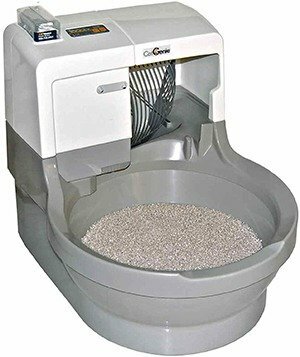 If you’re looking for a relatively cheap litter box that is easy to use, look no further than this model. When buying an automatic litter box, you'll want to be sure that you get your money's worth out of it, and that will only be possible if the product is reliable enough to operate for a long time. 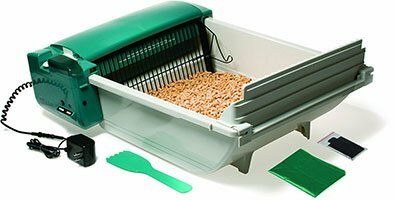 The Pet Zone Smart Scoop litter box is designed to be as durable as possible so that it can provide you with years of service. For example, the motor in this litter box is reinforced for extended use, which is a notable feature due to the electric motor often being the weakest point of automatic litter boxes. Beyond the motor, the gears on this model are made of metal so that they won’t end up snapping or degrading. One of the other advantages of this litter box is that it is compatible with all forms of clumping litter, allowing you to get refills from your local pet store instead of online. 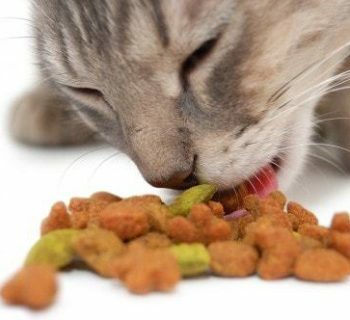 This also gives you the option of using the litter that your cat prefers, making acclimatization much simpler for your feline friend. This model even comes included with six plastic bags for waste disposal, which should be long enough for at least a month of use. Overall, this litter box is designed for buyers who are tired of unreliable products that fail within months of being purchased, and its value for money is nearly unmatched. 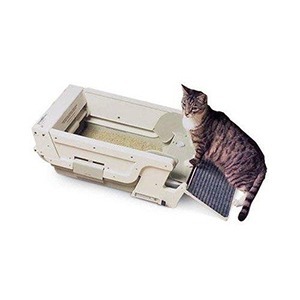 We hope that you’ve been able to find the right model of automatic litter box out of the five choices that we have presented throughout the guide. 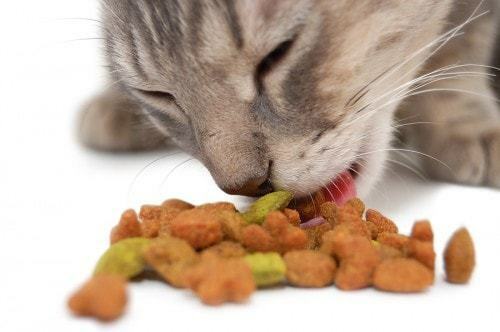 We’ve provided such a wide variety of litter boxes to increase the likelihood of at least one of them being suitable for you, ranging from affordable options to more high-end choices.